This tutorial will explain how to install Linux Fedora 13 on Asus Eee PC (netbook) using a USB media (USB flash drive). 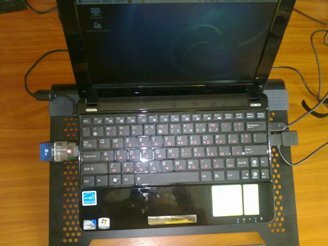 I have successfully done it using Asus Eee PC 1005PE. The installation can be done even with a SD card booted directly from the internal card reader present on the netbook. 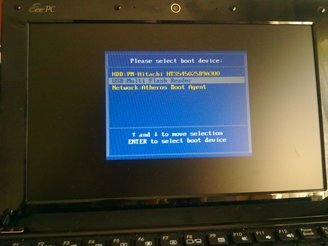 Please note that the same procedure can be used to other computers not just the Asus Eee PC. 2. Download Fedora 13 and create bootable USB media using LiveUSB Creator. If you have already dowloaded Fedora LiveCD just click Browse and select it. 3. Plug in the USB flash drive and turn on the computer. 4. Press ESC. A screen that offers you to select boot device will apper. Select the USB media. 5. Click on Install to Hard Drive icon once Fedora 13 has been loaded. 6. Follow the instructions to complete the installation.